Havana (AFP) - Venezuelan President Nicolas Maduro is hanging onto power in the crisis-wracked country in large part thanks to backing from the military, which according to the United States is receiving support and advice from Cuba. "The time has come to liberate Venezuela from Cuba," US Vice President Mike Pence proclaimed Monday. "Cuba's malign influence is evident in Venezuela and in Nicaragua." Donald Trump's National Security Advisor John Bolton branded Venezuela, Cuba and Nicaragua together as a "troika of tyranny" in November. 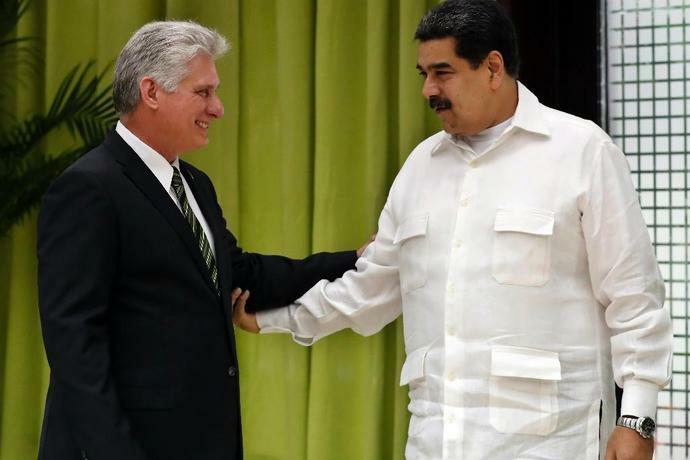 Cuba was also one of the first countries to offer its "strong support" to Maduro on January 23 after opposition leader Juan Guaido declared himself acting president. Chavez, who was Venezuela president from 1999 until his death in 2013, "admired Fidel Castro, it was almost like a father-son relationship." "The Cuban engagement in Venezuela began then and very, very strongly," added Shifter. Cuba has gradually taken control of "five sensitive national security areas: Notary registers, identity papers, intelligence, the armed forces and the national police," San Miguel said. "Cuba got far more out of it than Venezuela," said former British ambassador Paul Webster Hare, who lived in both countries and is now a professor at Boston University. "There were no two countries in the world that had as... integrated governments as Cuba and Venezuela. "There are reports that Maduro has Cuban intelligence briefings every day." 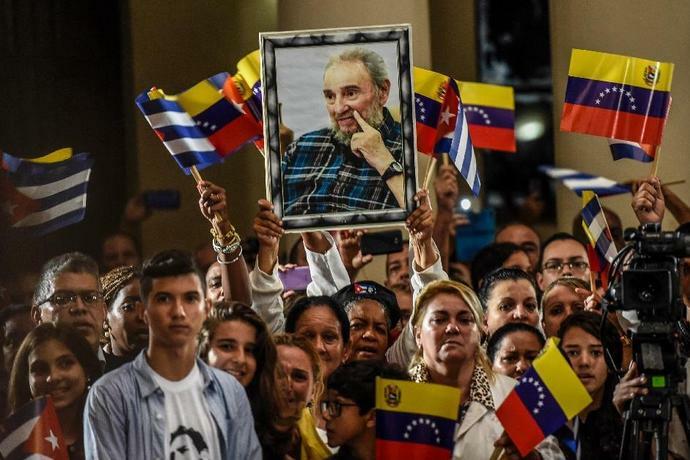 San Miguel went so far as to say that "in the decision-making process there is Cuba above Maduro," although Shifter insists "there is no evidence of that." Several high ranking officials in the foreign affairs ministry have repeatedly blasted Bolton as a "liar" on Twitter after he suggested Cuba was directing Venezuela's military. They compared those "lies" to US claims that late Iraqi leader Saddam Hussein was hiding weapons of mass destruction -- which were never been found -- used as justification for the Iraq War. "I think they're extremely worried," said Shifter. "I saw some worry," said one diplomat who took part in the meeting. "They felt a bit backed into a corner and needed to clearly explain their position," said another, adding that "there's a real worry about a loss of profits" if Maduro leaves power. "Cuba has already been looking for alternative oil suppliers: they got some from Russia, from Iran and other countries," he said. "Diplomatically, it would be a major blow," he added, leaving Cuba increasingly isolated. And then there's also "the threat of the US setting its sight on Cuba after Venezuela," said Shifter, saying the Caribbean island nation itself could be in US sights for new sanctions. As for Maduro, "if he doesn't fight until the end and decides to go into exile," then Cuba would be "a logical place to go." SEOUL, South Korea (AP) - North Korea on Saturday issued a relatively mild criticism of White House national security adviser John Bolton for calling on North Korea to show more evidence of its disarmament commitment before a possible third leaders' summit.